When it comes to preventing the growth of the waste electricals stream, the gold standard has got to be designing for disassembly. With increased focus on the circular economy, the idea is often talked about but, it seems, rarely practiced. Dutch company Fairphone, though, is taking action on this front as part of its social, environmental and ethical aims. 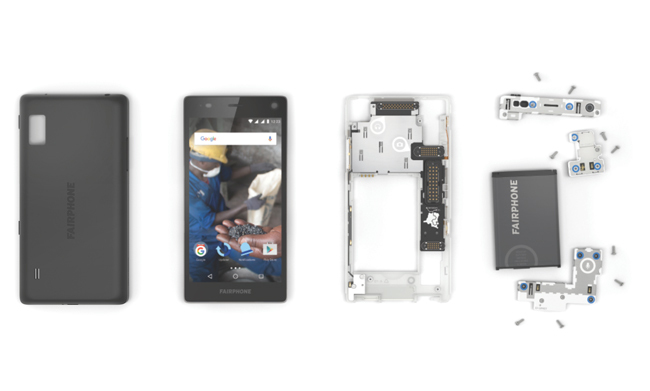 The first version of the Fairphone was launched in 2013 and featured conflict-free tin and tantalum, a recycled polycarbonate body, an open-source operating system and replaceable battery, a dual SIM system allowing users to merge work and personal phones (for instance) and a promise that manufacturers throughout the supply chain were paid a living wage. The phone retailed at €325, with the company selling out of the 60,000 handsets manufactured. The spare modules available on the website include the core (where most of the connectivity activity occurs), and camera and display units, as well as the battery, and the company has partnered with iFixit to create open- source repair guides, allowing anyone who’s got a screwdriver to perform basic maintenance. The company is aiming to buck the trend of ever-more integrated smartphones, which make models thinner but harder to repair (and, indeed, recycle). Fairphone says that (in part by incorporating a protective case), it has been able to keep its thickness in line with other smartphones. The design will go a long way towards reducing the waste created by the company’s customers, though, given their limited numbers, this is unlikely to have a big impact on the market as a whole just yet. And market penetration is far from the only hurdle left to clear, with the spokesperson explaining: “The main challenge is the complexity and the global character of electronics supply chain. To produce just one smartphone, more than 40 minerals are needed and hundreds of suppliers such as smelters, refineries and component manufacturers all over the world are involved. “There are literally thousands of social and ecological standards that can be improved in the production of smartphones, and we have defined interventions to gradually address some of them. But they can’t be overcome all at once, and some things are simply impossible to achieve right now.” We wish the company luck in its journey towards a truly fair (and eco- friendly) phone.